The documentary has been described as a fraud. 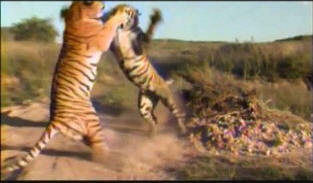 The tigers were apparently unable to hunt, and the film crew chased the prey up against the fence and into the path of the tigers for the sake of dramatic footage. Cory Meacham, a US-based environmental journalist mentioned that "the film has about as much to do with tiger conservation as a Disney cartoon." In addition, the tigers have not been released as the film suggests — and indeed still reside in a small enclosure under constant watch and with frequent human contact. The Discovery documentary contains footage that its maker, John Varty, has admitted on affidavit to be false. There are claims that Tiger Canyons' Tigers have no conservation value, and experts question Varty's intention of building Tiger Canyons as a ecotourism industry in South Africa. Most experts concluded that it is just a money-minded venture which allows money to be earned through the deception that the tigers there are purebred, but in fact they have no conservation value as they are of mixed ancestry. Conservationists fear that the public will be misled in this cynical fashion. Information on Wikipedia is being maliciously changed and altered to cast doubt on the integrity of John Varty and the Tiger Canyons project. 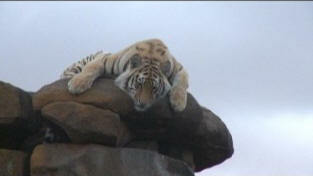 When Tiger Canyons began in 2000, there were reputed to be 5000 tigers in the wild. Today, in 2011, this number is closer to 1000 wild tigers. At the same time, in captivity around the world, 45 000 tigers reside in zoos, circuses and private collections. These tigers will never be wild tigers. John Varty, the founder of Tiger Canyons, has repeatedly called for the privatization of tigers, because the governments of the tiger countries have failed so dismally to protect them. He has urged the South African National Parks to set up a full scale National Park in South Africa to save the endangered tiger. 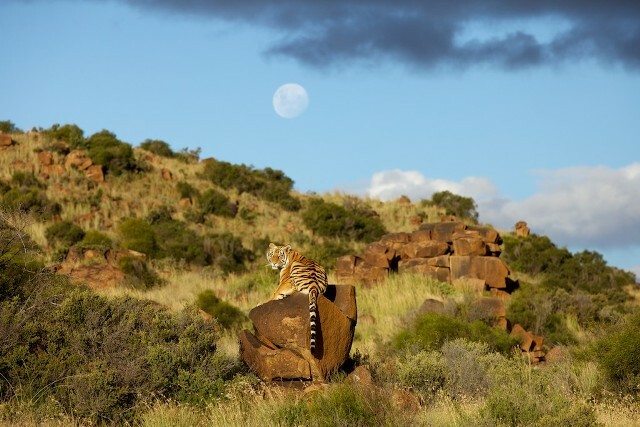 In South Africa, Varty was the architect of a 36 000 hectare tiger sanctuary called Tiger Moon, which straddles the Gariep River and lies in the Northern Cape and in the Free State provinces of South Africa. This park has been in a 9 year arbitration. Millions of rands that could have gone into tiger conservation, has gone into legal fees. Varty designed a second park of 15 000 Ha, called the Freedom Park in the province of the Free State. This park, thankfully has thrived and has rare species like roan, sable, disease free buffalo and rhino on it, although no tigers. The Freedom Park today earns 10x more than a sheep farm and is quickly returning to its prime energy flow under wildlife. In the province of the Eastern Cape, another area of prime tiger habitat has been targeted. Permission is being sought from the authorities to launch this park. 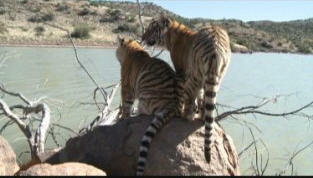 In Mpumalanga province of South Africa, an area has been surveyed for yet another tiger sanctuary. Like McDonalds the fast food company, Varty's vision is clearly franchising the wild tiger concept, using Tiger Canyons as the base experiment. The name of Varty's game is capturing land for wild tigers wherever he can and at the same time, bring like-minded private individuals into the tiger conservation business. In the thousands of emails and messages on Facebook that Varty gets from all over the world, the most common thread that runs through them is the word "envy". People envy his lifestyle. The ability to interact with tigers on a daily basis. A simple uncluttered lifestyle of freedom observing and filming wild tigers. His brother Dave wrote in the foreword of the book Nine Lives, "One hundred years from now it is entirely possible that relationships with wild animals will no longer be strange and bonds of kinship will be re-established between many of the earth's species........ JV's relationships with the world of nature have become increasingly stronger and profoundly deeper, to the point that he has effectively abandoned the world we know - with its politics, greed, conflict and crime. To me, JV is a messenger sent to us from the future. He implores us to change our ways as he illuminates a future course of action through these dark days of destruction of the natural world. He has used cinematography to shine a light on the magical intelligence and regenerative powers of nature, inspiring the imaginations of young minds, many of whom have aspired to being young John Varty's. Years later it is those selfsame kids who have chosen to dedicate their careers to the restoration of our Eden." As the malicious misinformation flows into Wikipedia, some of the envious take their jealousy to the extreme. Cory Meacham, a US based environmental journalist mentioned on Wikipedia that "Living with Tigers" has about as much to do with tiger conservation as a Disney cartoon". 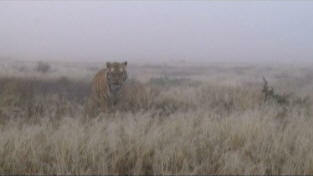 In addition the tigers have not been released as the film suggests. Varty points out that he has never met Cory Meacham, nor has Meacham ever been to Tiger Canyons. Varty is not aware that Meacham has ever done anything to save the tiger. The fact that Tigress Julie has caught 80 wildebeest over the space of 30 months, as well as springbuck, blesbuck, warthog, mountain reedbuck and other species including barbel, clawless otter and water mongoose, is not mentioned by the ignorant Meacham. How can Meacham and others know that the tigers reside in small enclosures. 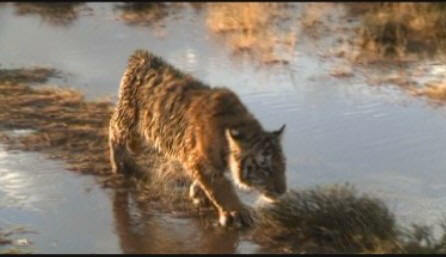 The area where Julie hunts and raises cubs, is 300 Ha, hardly small. The new hunting area recently completed and stocked, has 4km of the rugged Tiger Canyons river, 4 more wild tigers will shortly be introduced into this area. "The Discovery documentary contains footage that its maker John Varty admitted on affidavit to be false"
The Discovery documentary scored very high ratings and continues to inspire and educate people around the world. The court case concerning the Discovery Documentary, Varty won handsomely. The statement on Wikipedia is defamatory. The fact that Varty is now making the first ever 3D film on tigers with Discovery, attest to their confidence in the fact that they believe that Tiger Canyons has the best chance of saving the wild tiger. National Geographic's "Tiger Man" series has followed "Living with Tigers" and judging by the rating and public's response, this series will have a huge impact on tiger conservation worldwide. Meacham and company display their ignorance when they say "most experts concluded that it is just a money-minded venture which allows money to be earned through the deception that the tigers there are purebred". The first thing that they don't understand, is that to save endangered species like the tiger, you need money, lots of money. When you have money, you need vision, after the vision, you need special skills, lots of tenacity and then you need to be able to execute. A lawyer, a banker, a fashion designer or an environmental journalist have neither the knowledge, the skill or the vision to succeed in a project of this nature. If Meacham and the Wikipedia editor (China's Tiger) read Nine Lives, they might understand that Varty has been trained for what he does. There are few people that have the skills to undertake what Varty is attempting. Do they think when the photographers come to Tiger Canyons and see a 500 pound male tiger stalking through the river, the guests are interested in what sub species of a tiger it is? The 500 lb tiger is magnificent in the morning light, water dripping from his coat, muscles rippling, eyes focused on the prey, legs hunched ready for the charge. Photographers have been mesmerized by this scene and have the photo's to prove it. Six modern Canon and Nikon digital cameras capture the moment at high speed. The atmosphere in the jeep is electric. The images travel over the internet, into books, magazines and image libraries. In short - the images educate and inspire people worldwide. The finest pictures of wild tigers ever taken, have been at Tiger Canyons and the standard of pictures being entered into the recent photo competition, are better than world class. This is how you save the tiger. Varty did it with leopard at Londolozi and now he's doing it with tigers. Just for Meacham and the other misinformed individuals, DNA has proved that all tigers are the same, Panthera tigris tigris - The Asian Tiger. The only subspecies is Panthera tigris sumatrae - The Sumatran Tiger and this will soon be lost to the world at the rate they are logging the island of Sumatra. So Varty doesn't concern himself with Meachams and Wikipedia editor "China's Tiger's" mental masturbation. 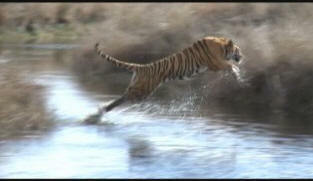 He asks the question, is the tiger strong, is it fast, can it hunt, is it well bred, will it have high reproduction? 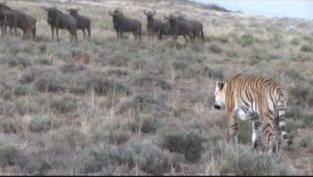 The litters born at Tiger Canyons are 3, 4 and 5, so Varty is satisfied his breeding is good. 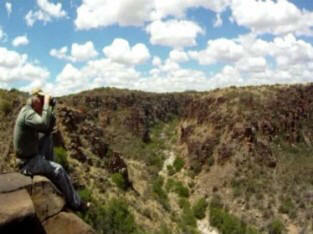 People from 42 nationalities have visited Tiger canyons, some have been more that 6 times. They don't come to photograph tigers in cages! To all the tiger supporters worldwide who have supported John Varty through successes and failures, through floods and natural disasters, disregard the saboteurs who change and manipulate the information on Wikipedia. They are nothing, they know nothing, they live in the dark world of envy and jealousy. I HAVE been to Tiger Canyons, I have met JV, his team and the tigers. I have been to Pench, Kanha and Ranthambore in India as well as zoos and private collections in many countries. The only difference between this and the Indian tiger parks is that it is on another continent and has an effective security fence keeping people and poachers out. To the tiger, prey does not carry a passport and the geography/geology suits the predator well. Tigers bred in zoos or in small cages in private collections will select for those qualities ie, docility, adaptation to confinement that enable them to be kept in such conditions. How much better is it to have tigers living in controlled areas where the natural qualities will select such as hunting ability, muscle development?. As to “the stud book” what nonsense: I cite dog breeding as an example. They are all in the stud book but now we have Bulldogs that cannot breathe because their noses no longer function through selective breeding with other “stud book” animals. Had the same project been possible in the tiger’s native countries with similar security and anti-poaching measures there would be no complaint. One of the Varty’s unsung claims is their pioneering work at Londolozi with leopards that has led not only to cloning of their operation throughout numerous countries but importantly has provided economic benefits to the local people through tourism in each case. 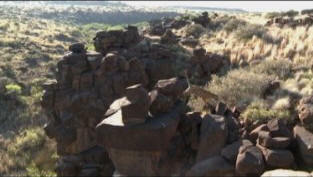 The area where Tiger Canyons is situated is one of the poorest regions of South Africa. Unemployment is high and the HIV infection rate among the local population is huge. Modelled on Londolozi’s successful, proven formula in due course the presence of these animals has the potential not only to provide a valuable bloodline for the tiger but depending on your point of view an even more important lifeline for the local people. So, which is the better option for these marvellous cats, a rapidly decreasing population in Asia and eventual extinction? But before settling for this option and casting the tiger to oblivion – or at least to zoo parks with tiny enclosures where the animals are fed soy vegetarian formula antelope burgers – go and see for yourself.